This is a pretty big mod, but it’s also really inexpensive. It’s also super ugly. But hey, we’re trying to save fuel here, not win SEMA. The key is to extend your front bumper down below the lowest part of your truck. The idea is to keep air from flowing underneath your truck. The less air running under your truck, the better. There’s a reason why race cars are so low to the ground. Ugly, sure, but it’ll likely net you over half a mile per gallon. Every little bit counts! I wonder where they get the 1/2 mpg figure? Actual testing? 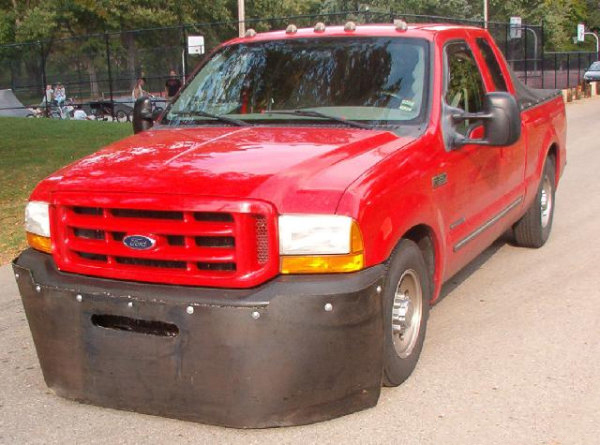 Minimizing the ground gap at the front of any truck has been very well proven to be one of the best aerodynamic aids. I've seen the test with my own eyes at Daimler's wind tunnel in Portland. I lost 1 mpg going from 2wd to 4wd. Some of it was due to weight gain, but I'm betting the lift and increased air going under the van was most of it. I lost 4 mpg doing the same thing. I stripped all the fiberglass body parts off and lifted 4" when I did my Quadvan conversion. I was thinking of trying to come up with a front skid plate of sorts that would smooth out a bit of the front wind turbulence. Anyone have any ideas for a front skid plate that would angle backwards from below the front bumper to the axel? Similar to like on an IFS 4runner, etc. Do you think it might help? QuadVan makes a SkidPlate similar to the one in that pic. How about the Air Tabs? I've also seen round disc type ones on the sides of tractor trailers.